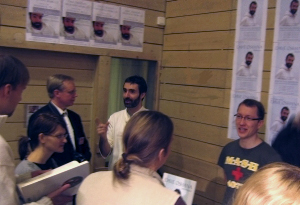 Enlightenment Transmission students and spiritual teacher Dave Oshana will be of service to thousands of spiritual seekers at the Espoo Minä Olen -messut 2007. Spiritual teacher Dave Oshana returns to the Minä Olen messut for the fourth year running to exhibit his most cutting-edge spiritual offering to date: The Oshana Spiritual Training Program incorporating The Enlightenment Transmission Experience. The Oshana Enlightenment Advisors will be available to give information about Oshana's 2007 Finnish events schedule at exhibition stand 260. Oshana will be available on the stand each day for private One-to-One consulations.